Small - $59.99 Only 1 left! The Teenage Mutant Ninja Turtles are a pretty fascinating group, especially given what most of us are doing in our teenage years. Take a small clutch of turtles, add some unexpected radioactive material, a skilled rodent ninjitsu master, and all the pizza they can get their hands on, and the team seems to put itself together on its own! Of course, those are quite a few requirements, now that we think of it… and any of those things are going to be problematic to acquire. And, even after you get all of those things lined up, there is still years of training with Master Splinter who is hardly the most patient of instructors. If only there were a way to skip some of that training… a way to sit back on the computer and hack your way through to the proper mindset of the ninja in a fraction of the time! If anyone could do it, we know just the right turtle for the job, too! 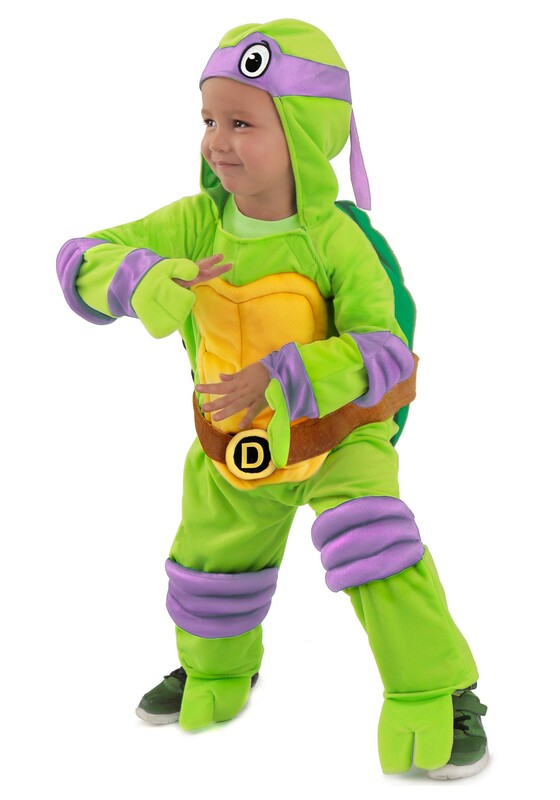 Fortunately, we have exactly that option available for you with this Child TMNT Donatello Deluxe Jumpsuit. The seemingly simple jumpsuit fastens with Velcro and has a keen 3D padded shell in back. Faux turtle feet cover your tyke’s boots and the purple colored belt, arm pads, and knee pads mark your kiddo as the key geek and computer wiz on the TMNT squad! Acquire some of those key accessories, like his iconic bo staff weapon and you are going to feel just like Splinter… though a little less furry.